I love irony. I delight in finding the unexpected coincidental connections or correlated contradictions that the universe appears to throw in our paths if we will only take the time to notice them. So I had dinner with neither Andre nor with Andrés as one might have expected given my predilections. (*See the 1981 film, My Dinner with Andre.) But if one considers the most important guitar virtuosos who were active during the same period of time as Andrés Segovia the name Narciso Yepes must inevitably come up. And I did have the honor of a long dinner conversation with Maestro Yepes. How did a 23 year old neophyte come to deserve such an honor? In 1976 I found myself working for a short while in the guitar shop of Juan Orozco at 156 West 56th street in New York. Orozco’s guitar shop could not have been in any better neighborhood for the artists, young and old, who regularly crossed its threshold. Directly across 56th street from the shop was the stage entrance to Carnegie Hall. Directly next door at 160 W 56th was the legendary Joseph Patelson Music House. And just as Carnegie Hall was the Mecca for performers of every stripe, all vying for their own small piece of the music history that was made daily in that august temple of music, and as Patelson’s represented a mandatory pilgrimage of those same artists to peruse the bins and shelves that filled the 19th century carriage house to where one half expected the creaking old floor to give out, so too did classical and flamenco guitarists pay homage to a higher esthetic that was somehow felt to inhabit Orozco’s. Perhaps it was just the neighborhood. One could certainly see how that alone would be sufficient to draw the faithful. Or maybe it was the knowledge that in this quaint shop Juanito (as we called him), a third generation luthier from Spain was repairing damaged guitars, selling instruments from advanced student level to concert quality made by luthiers from all over the world, and manufacturing guitar strings. Then there was the networking. All manner of players could be encountered in this little shop, at once humble as it was illustrious. Jorge Morel, one of the great icons of the guitar world was a friend to Juanito and to all who entered the shop, and when he wasn’t touring he could often be found sipping a coffee there with employees, customers and visitors alike. Coffee was the oil that lubricated the social machinery that made Orozco’s special, at least twice every week provided by the retired flamenco virtuoso Manolo Baron. Manolo was quite the character. He had spent years touring the world with the great flamenco dancer José Greco. Manolo’s wife Carolina had been Greco’s dance partner. These people rubbed shoulders with the Hollywood elite of their day, Charlton Heston, Ava Gardner, Esther Williams, Mitzi Gaynor, among others. Manolo and Carolina had retired from performing and opened a dog grooming business in Queens NY, and now he would come in to visit, drink coffee and make small talk. He would always stop at a local deli and buy as many coffees as could fit in a box, so his arrival at Orozco’s marked the beginning of a coffee break for everyone who worked there. One day, as we sat sipping our coffee with Manolo, an elderly gentleman in large thick dark glasses and enough expensive rings on his fingers to have opened a jewelry store strode into the shop. This was Sabicas, the man regarded by those who really understood flamenco to be its best guitarist in the world. Sabicas, known to be a real Gypsy, having Romani bonafides, had come to pick up an instrument that Juanito had repaired for him. As he entered Manolo lept to his feet, and as the two virtuosos embraced Juanito deftly pulled 2 guitars from the showcase, handing one to each of them. The impromptu concert that ensued was the stuff of legend. And almost as soon as they began to play Juan’s right-hand man and store manager Tony picked up the phone and dialed The American Institute of Guitar. AIG, located on West 54th St. was a guitar school specializing in classical and flamenco. The moment they got Tony’s call they ceased all operations, locked the door, and all teachers and students made the most haste to get to Orozco’s in time to witness this extraordinary event. Within minutes there was a crowd spilling onto the sidewalk. 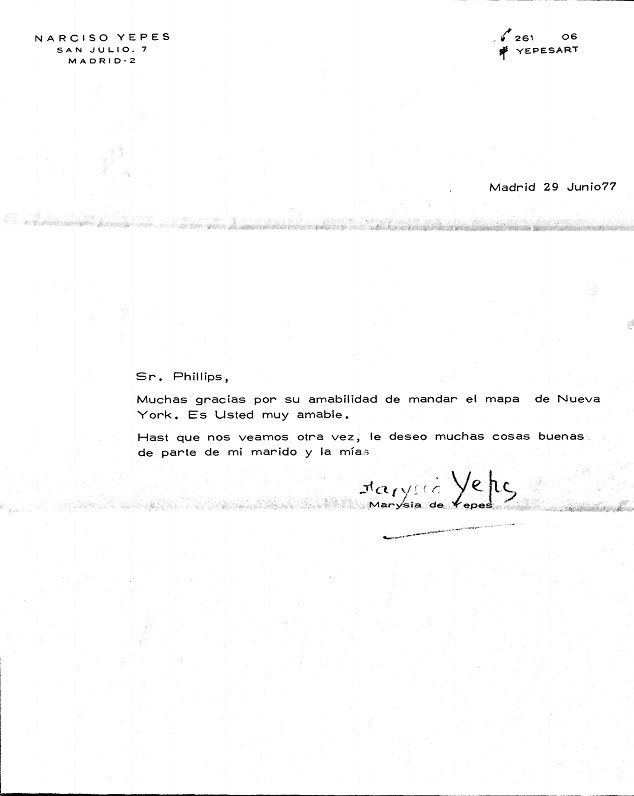 And so it was while working at Orozco’s that I was asked to pick up Narciso Yepes at JFK airport. One of Juan’s other hats was that of concert promoter, booking some of the finest young players at what was then called Carnegie Recital Hall (now known as Weill Recital Hall at Carnegie Hall) and some of the greatest established players at Alice Tully Hall in Lincoln Center. Yepes was scheduled to give a concert there. I introduced myself to the maestro, helped him retrieve his baggage, and proceeded to Juanito’s Mercedes. With Yepes comfortably settled into the passenger seat, I turned the key and – nothing! The car cranked and wheezed, but would not start. We waited a few minutes and I tried again, and again, nothing. Although, in those ancient times, we enjoyed the convenience of meeting our arriving travelers at the gate, we nevertheless had to somehow survive without the as-yet-to-be-invented mobile phones. 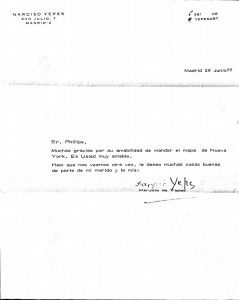 Thus, it became incumbent upon me to get Yepes and his baggage back to the terminal where we would be able to get a taxi back to Manhattan. In the cab I showed him the New York Times ad for the concert. Yepes was legally blind, and wore thick glasses that magnified his eyes. From his jacket pocket he produced a magnifying glass and holding the newspaper a few inches from his eyes he used the glass to read the ad. I wondered how he could read music, and years later would learn that he would use the same technique to memorize the page before playing it on the guitar. The following evening Elena (my wife at that time) and I attended his wonderful concert at Tully Hall. We enjoyed a delightful reception given by Orozco immediately after, where we would chat a bit with the maestro. We had no idea that we would get to know him much better in another 2 days. The following day Juanito asked to speak with me. “You have, eh, car?” (Juan’s English was not too good.) Since no one in New York City except for the wealthy own their own cars, this was a valid question. As I lived in Elmont, NY, a suburb just across the Queens – Nassau County border (a few blocks from the Belmont Race Track) owning a car was more of a necessity. So, I confirmed with Juanito that, yes, I had a car. “Tomorrow, Yepes have concert in Long Island. Brookhaven National Lab.” He said “Brookhaven National Lab” very carefully, one syllable at a time. “Maybe you can, eh, drive him to concert tomorrow, and back to hotel in New York?” I told him that I would be honored, which was a gross understatement. I was honored, flattered, ecstatic, excited, and any other emotion one might expect from a young player having the opportunity to have such a great artist to himself for the 90 minute one way trip from the city to Brookhaven, and then back again. The day after that, I went in to work, and Juan sent me home early to get my car to pick up Yepes. When I arrived home, Elena announce that she had come close to committing a terrible faux pas. The phone had rung a little earlier and she answered it. A thin voice with a Spanish accent had asked to speak with “Mr. Robert Phillips.” For some reason, she thought it might be a prospective guitar student, and was about to respond with, “Are you interested in taking guitar lessons?” But something told her that it might be better to inquire as to who this caller might be, which, of course, turned out to be Yepes. I laughed a bit and told her that he would probably see the humor in it, and although it was good that she hadn’t responded that way, it would not have been terrible. He had left his phone number at the hotel, and I called him back and arranged for a pick up time. We arrived early, and Yepes asked the stage manager to call ahead to the restaurant so that we could have some dinner before the concert. When we arrived at the restaurant we were told that we would have a private dining room since most of the diners would likely be attending the concert. We were escorted by a circuitous route into an expansive dining room that had several empty tables and one in the center of the room set for three. I recall being surprised that Yepes ordered a beer before playing a concert. There were a good number of selections on the menu, and at one point each of us toyed with the idea of ordering an appetizer of Swedish Meatballs, but in the end we all chose something else. The appetizers were brought to the table along with a small plate of the Swedish Meatballs for us to sample. During dinner I asked the Maestro if out of all the great performances that he had given over a very active career there were any that stood out as being special or memorable. He told me a remarkable story. I was awestruck. The story certainly sounds apocryphal, and I will say that I made a decision to believe him. Then I commented on what an exciting and interesting life he was having, performing all over the world for devoted fans of the guitar. “Sometimes I wish I were a little less famous, and a little more happy” he replied. Yepes asked me some questions about the geographic placement of Manhattan, Queens, and Long Island. He wondered where my home was relative to them, and where Brookhaven was on Long Island. He expressed a desire to see them all on a map. I offered to send him one, and he gave me his home address to send one to him. Yepes was given the bill for the meal, and our exit now took us through the main dining room where the evenings concert goers were enjoying their meals. As we walked through the room we could see each table suddenly grow quiet as the diners stared. Yepes leaned over and softly said in a bemused tone in my ear, “They seem surprised that I eat,” and he chuckled. His concert went well. He was called for several encores, and when he decided that he had played enough of them, he snapped up his foot stool from the stage and made his exit. We drove him back to Manhattan, and returned home feeling ecstatic from what could only be described as a magical evening. A few days later I mailed him his map of New York City and Long Island. A few weeks after that I received a short but very gracious note from his wife, Marysia. Notes From the Bo(a)rder: Why the Guitar?